Greenberg Minasian, LLC, is pleased to announce its recent induction into the New Jersey Law Journal’s Hall of Fame for 2015. 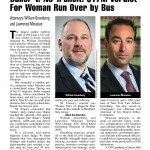 The prestigious recognition stems from the firm’s $17 million verdict in 2014 (Baker v. New Jersey Transit). The award was included as part of the highest and second-highest verdicts or settlements in six different categories. Greenberg Minasian placed first in the “Public Liability” category, and had the second highest award amount among all the recognized law firms in all categories. 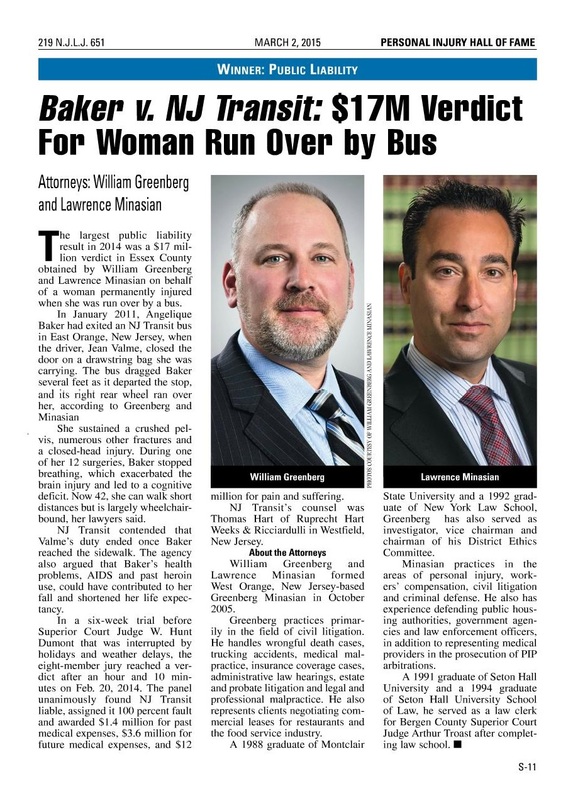 In early 2011, Greenberg Minasian’s client exited a public transit bus in East Orange when the bus driver closed the door on a bag she was carrying. The bus dragged the client as it departed, crushing her pelvis and causing a cascade of other injuries, including a closed head injury. The client underwent 12 subsequent surgeries for her injuries, including one that caused her to stop breathing, exacerbating the head injury and leading to a cognitive deficit. In February, 2014, an eight-member jury awarded GM’s client $17 million for past and future medical expenses, as well as pain and suffering. The recognition from the New Jersey Law Journal is just one of several recent awards and recognitions Greenberg Minasian has received. Those include the Top 50 Verdicts of 2014 from The National Law Journal and the 2014 Litigator Award.